This tutorial will show you how to construct a duct tape dummy (DTD), supplies that are needed, as well as where to cut once finished. 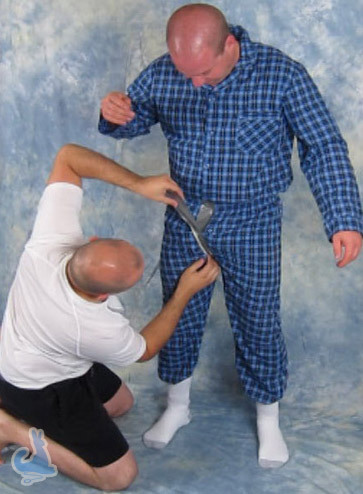 For our demonstration below we have used pajamas but highly recommend painter coveralls (can be found at Lowe's, Home Depot or local hardware/paint stores). They range between thin to thick but we suggest going with the thin, mostly cause its easier to cut as well as affordable (usually around $9). Also don't forget to wear something underneath the coveralls, preferably tight so they don't accidentally get cut when trying to remove the DTD. The crotch area is one of the most important parts on the DTD, so we will start here first. You can accomplish this by taking long strips of tape and wedging them in and under, front to back, making sure at the same time that you do not pull up the pants too much that they pull out of the socks. Continue making a couple of passes in a V shape like pattern. To keep it close to the underside you can run a couple of lengths of tape around the belt-line to keep the crotch area from sagging. The main goal here is to make sure the crotch doesn't sag, which could throw the leg proportions off when creating the body suit. Now you can start wrapping the duck tape around however you want, but BE SURE not to make it too tight or else this will make it difficult to breath and getting out of. Usually I'll give the tape some slack and press down on the tape as you go, rather then pulling on the tape roll around your victim. Keep continuing around making sure to press down the tape as you go and all the surrounding areas. For ease of breathing and comfort, you can start going down the legs next and leave the upper half for later.